KGS FAQ - Foire Aux Question - What is automatch ? What are the time displayed in italics? What is KGS policy about escapers? The automatch feature is the easiest and quickest way to find an opponent on KGS. You decide a couple of settings then let the server pair you to a matching opponent. If you have a rank, it immediately looks for an opponent. The spinning wheel in the menu lets you know it is running. You just need to wait for a game to pop up! You can also cancel a running automatch. If you have no rank, the automatch setup window raises and asks you to pick up your rank. 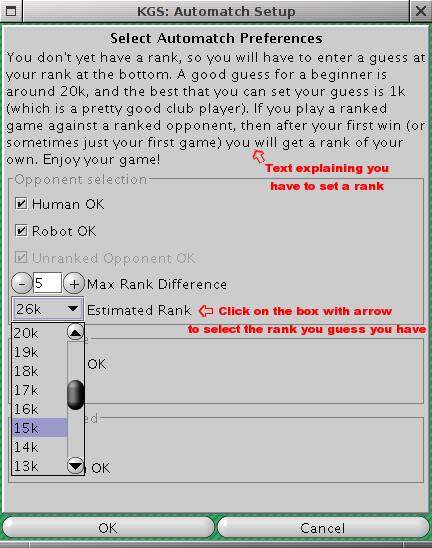 You can also edit the settings by selecting "Automatch Preferences" in the "Play Go" menu. Hover for a while the different game speeds with your mouse to raise a tooltip with details. Tip: The "OK" button is the default button of the setup window, so you can select it with the mouse or use the "Enter" key of your keyboard to enable it. Last advice: If you don't want to wait much, check a lot of boxes and set a high max rank difference. Have fun ! With the info so far, you should be ready to go back to KGS and test the automatch feature. But if you still have questions, read the end of the page. Can I start a custom game while automatch is running? Yes. If automatch doesn't pair you quick enough, feel free to start a custom game too ! Your games requests will be cancelled as soon as your game pops up. Can I change the time settings? You can check several boxes, but you can't choose different settings from the proposed ones in the automatch preferences window. And you can't uncheck all the time boxes, the system will ask you to check at least one of those. Is there a confirm window before the game starts? No, the game pops up as soon as a fitting player is found. There is no confirmation. Make sure to use some settings you want to play in the automatch preferences window. If there are users you don't want to play, just censor them and you won't get paired with them. What happens if I leave an automatch game? If you leave a rated automatch game, you'll be marked as escaper for the game. You'll get the mark if the games has less than 10 moves, and even if you leave during the countdown before the first move. 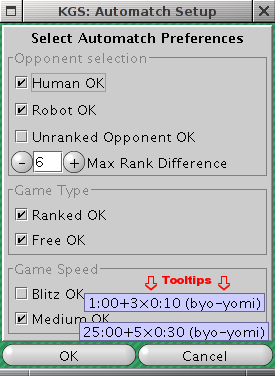 Make very sure your automatch settings fit what you want before launching an automatch lookup, so that your opponent will please you. How do I save an automatch game? There is nothing to do. All the automatch games are automatically saved by the server, whatever number of moves they have. Djaian: If both players select "free" and "rated", will the automatch be free or rated? The system will set a rated game.